Last weekend I continued the tradition of getting some mates down for a bit of a painting session. We set up in the man cave and settled down for day's clipping, gluing, painting and basing while talking shite and listening to various stand-up comedy routines on the interwebs. It's rather amazing when your hobby usually comes in one hour bursts of an evening, how much you can get done in a full day. I managed to build a 50x50mm base extender for my meargh, a small but necessary job I had been putting off. Plundering other folks hobby supplies is an unexpected boon as well. I was offered a stash of volcanic rock for tarting up the base extender which, due to whatever way it forms, scales excellently to 28mm miniatures. I managed to fix a fimm standard bearer who had been damaged in battle, a fiddly job as the standard broke at the top of the pin I had put in, meaning I had to pare back the plastic to reveal enough pin to allow me to glue it back into a newly drilled standard pole. A real pain in the h$*e. He still needs a little paint before he is re-admitted to the cabinet. Finally, I painted three wyrm daemons which I'll be using as 'crew' for the hellcannon version of Crom. All in all a goodly day's work. My hobby brethren assembled manticores, artillery, hellpit abominations and terrain along with a bunch of other bits and bobs. I am still chuckling after one irate comment: "Argh! 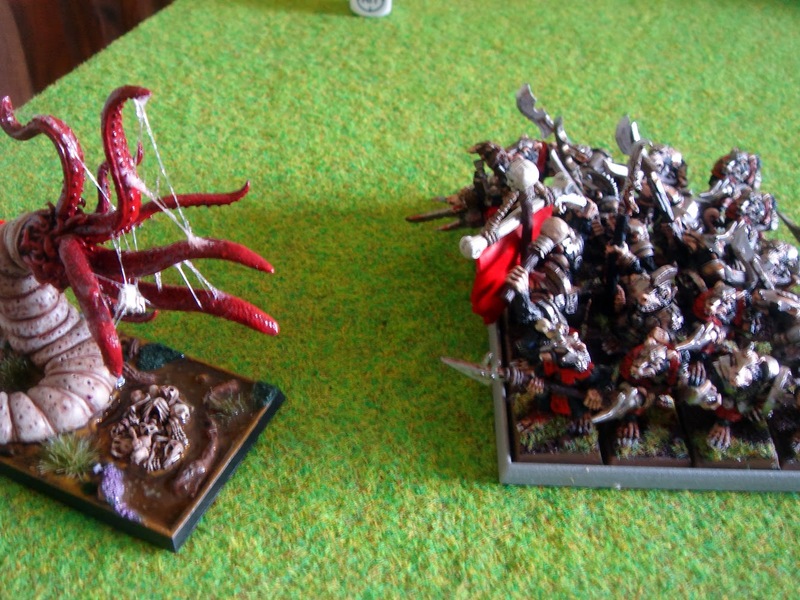 There's nowhere I can put my fingers on the plagueclaw catapult where there aren't f@$king spikes!!" A very pleasant surprise was a box of dark elves that was presented to me as the owner had left the hobby some time ago and they were just hanging about. Delving in I discovered a cache of 3rd edition dark elves, warriors, command and characters, some Marauder, some Citadel. Lovely. Some games were then played. The very simple bit tremendously fun Ribbit. A great game for kids as well as bitter veteran gamers. After wiping off the blood of the innocent, we thought we'd give Triumph and Treachery another go. I enjoy this expansion, and this time proved no different. Skaven, Orcs & Goblins and Fimir (chaos warriors) played hold the centre using only 500 points each. 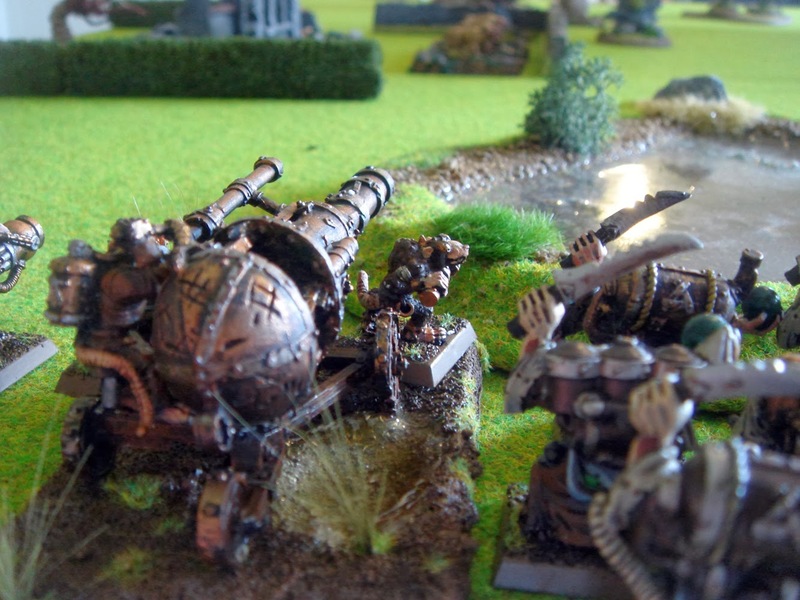 Over the course of the game it tooed and frooed with pleasant regularity, the skaven initially causing terrible damage with thier ranged weapons while the goblins shoved two fanatics in front of my chariot, smashing it to splinters. Of course, the next thing they did was panic off the table along with the spider riders. Heh. The cards provided constant hilarity, frustrating skaven shooting phases and removing rank bonuses. Not before the warp lightning cannon blasted Crom off the table though. I managed to take the centre and rack up a couple of turns worth of victory tokens before charging Grunsgul into the remains of the savage orcs and getting butchered. MVP certainly went to the savages, who chopped their way through skaven globadiers, the lightning cannon, stormvermin and finally my dirach. Still, I managed to come out with the most coinage and stole the win. Great fun.T&T rewards aggressive abandon combined with ruthless back stabbing, so perfect for my group. All in all a good weekend, we'll certainly be doing the painting/chatting/drinking thing again. After something of a break, the fimir train is leaving the station. The first one-eyed marsh fiend of the new year is a character, the aged dirach Grunsgul. Originally this model was merely a base extender for my meagh to giver her a 50x50mm base, but has somehow ballooned into an entirely new model. The meargh sitting on the floating rock just looked, well, lame, so I had to make a rider that would sit more naturally on the plinth. I also wanted to be able to use Grunsgul on foot. If I had to build a whole new character, I was going to get the most out of him. Thus it was time for magnets. I hadn't used them before, but once I'd located the appropriate drill bits all was well. The most nerve wracking moment was drilling into the already finished plinth with a power drill, but all went swimmingly. The model is from Oakbound Games, with some small conversion work. I added horns, as befits a dirach, and also a torc on his arm and a tathlum (concrete balls on a chain) hanging from his belt. On the plinth itself I added some more bits and pieces. A jawbone, book of spells and scroll, as well as the little familiar. 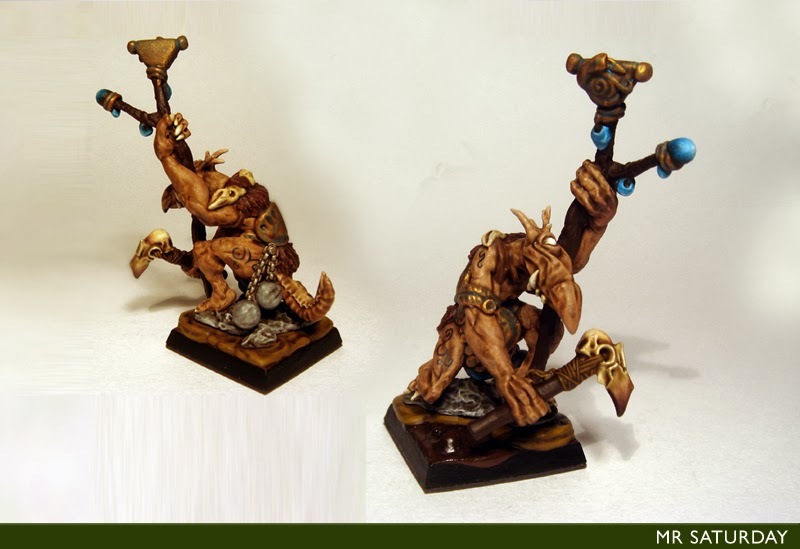 Dirach are also known as daemonfriends, and have a particular daemon they forge a close alliance with. In this case the diminutive scroll carrier. The recent Metal Beards kickstarter from Titan Forge has just ended with great success, achieving just under £31,000 and funding two new ranges, the metal beards and their evil cousins, the sons of Kashan Vra. 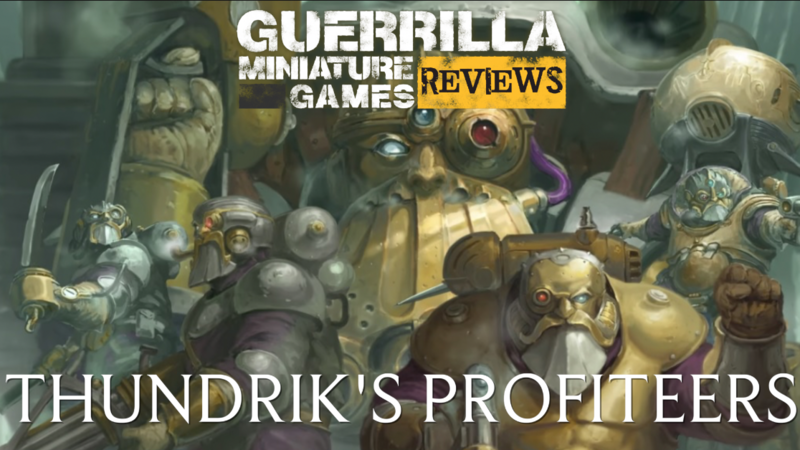 Once these fellows are released, it will be possible to build an entirely mechanical dwarf army, not to mention the wonderful new models that are on the way for those of us with chaos dwarf armies. 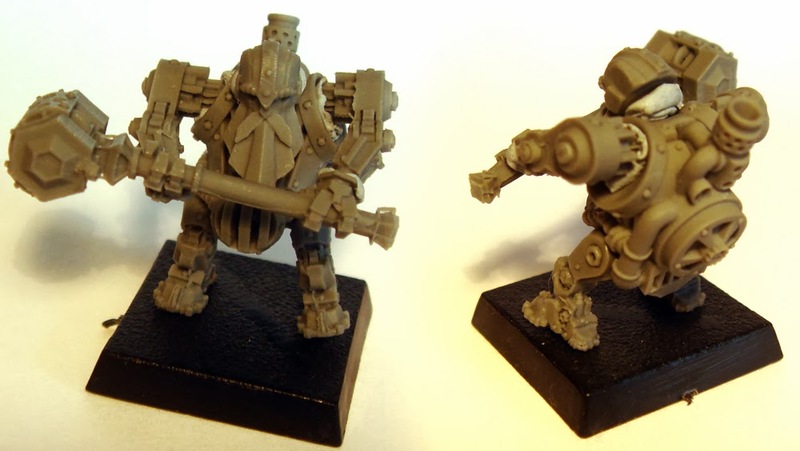 I can only rub my hands together in anticipation, though I did get a little sneak preview of what we might come to expect on release.Titan Forge were kind enough to send me some of their anvilborn warriors to take a look at for the Mumblings, so here's the low-down on these diminutive mechanical dwarves. The five metal beards in the pack came with a choice of two heads, two bodies and two hammers. There are four head options in the final release, as well as hand weapons and shields and two ranged options. 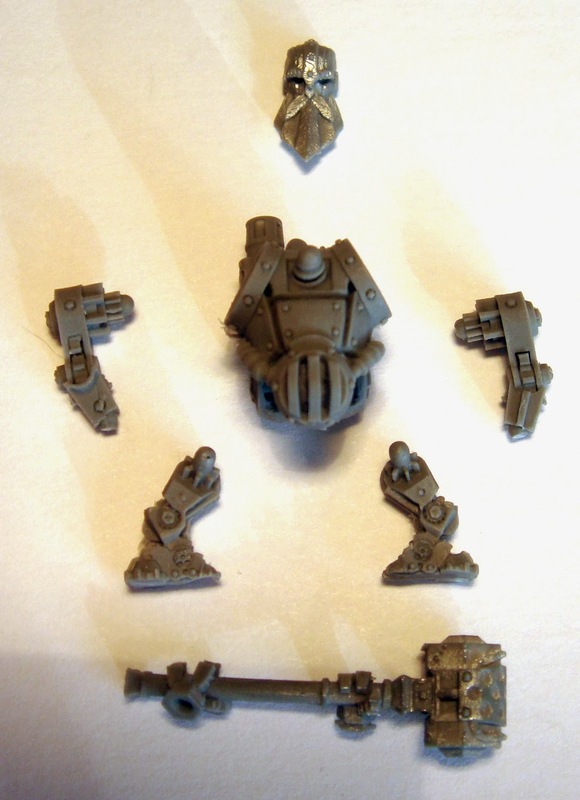 As you can see, there are seven elements to each model, which may take a little longer to assemble than some models, but opens the way for huge conversion potential.Those heads would make fantastic helmets for regular dwarves, for example. These miniatures are obviously pre-production. The parts are extremely crisp, with a lot of detail to keep the model interesting while painting it. If the final production versions are this good there will be negligible clean-up before assembly. The pieces are quite robust, nothing is overly thin, so breakage should not be an issue. As to assembly itself, they go together very easily due to the ball and socket fit for the joins. The two-handed hammer requires a little consideration to attach to the arms, but a dry fit before glueing will avoid any problems. Once the model is together you can either attach it to the scenic base the final models will come with or go your own way. As to scale, the model below is on a 20x20mm base, so they are essentially equivalent to current Games Workshop dwarves. For painters, these models will be a chance to go to town on metals. 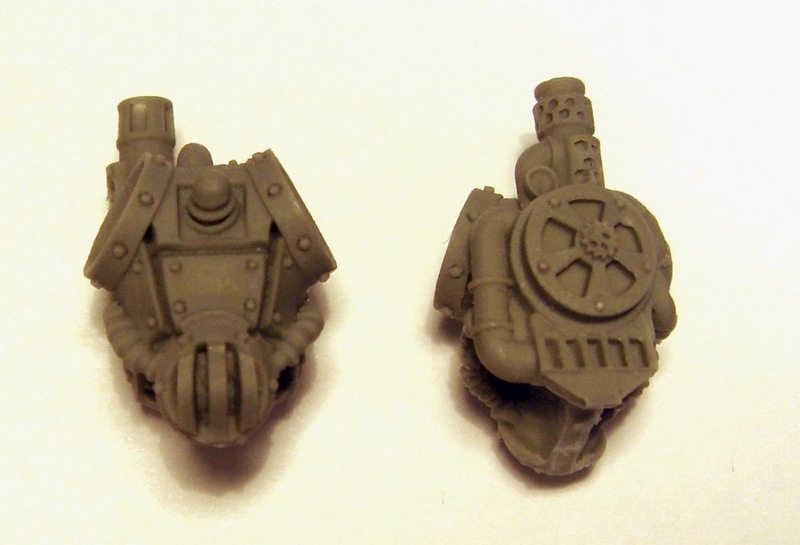 There are elements like the head that can be painted like lacquered armour, but the boilers, valves, dials, cogs and exhausts will reward some research on different metal surfaces, as well as some OSL effects coming from eyes and boilers. You can see on the back of the model above there are a lot of details there to go to crazy on. It might be worth attaching the arms after painting to let your brush into the various areas on the body. The exhaust on the top begs for some models to have smoke effects added. This would look pretty superb in a unit. That said, they would paint up very well with two or three colours and some washing and dry brushing too. I can see a lot of dwarf players adding a unit of these to their army, or even going full metal. They will definitely be a show stopper army on the tabletop. Titan Forge have a history of producing amazing themed ranges and this one looks to be another winner. The kickstarter release is in April, so full release will probably be sometime this Summer. 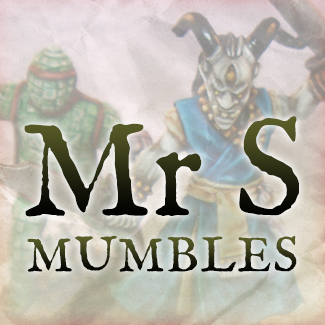 Another glorious achievement for the Mumblings, over the weekend the blog hit the 200,000 page views mark. Surely there will be a parade. It's official, Games Workshop have released information on the new White Dwarf Weekly & Warhammer Visions magazines here. I'm particularly intrigued by the mention of games rules in WD weekly. As for the visions magazine, it sounds sumptuous. Fingers crossed. White Dwarf magazine goes weekly! Saturday 1 February sees the birth of the new, weekly, White Dwarf magazine. Saturday 1 February sees the birth of the new, monthly, Warhammer: Visions magazine. Yes, that’s right. We’ll be launching two new magazines on the same day, Saturday 1 February. White Dwarf will contain everything that’s new and exciting in the hobby that week, from news and information on all the week’s other new releases, to new columnists, interviews, painting, modelling, game rules and much more. And the price? The same as a pot of your favourite Citadel paint. Warhammer: Visions will be available on the first Saturday every month in your local Games Workshop store, Independent Stockist, games-workshop.com and local newsstands in the UK, Europe and Australia. Warhammer: Visions is a completely new monthly magazine, also from the White Dwarf team. It’s unlike anything we’ve ever done before and this super high-quality visual feast weighs in at a whopping 236 pages, each and every month. Just 17 days to go and counting. After months of planning and hard work, we’re really excited to be able to share this news with you. We were overwhelmed by all the support and feedback you gave us last time we relaunched White Dwarf back in September 2012 (and by your emails and photos that you send us every day – please keep them coming), and we’re even more excited by what we’ve got coming up for you in 2014. 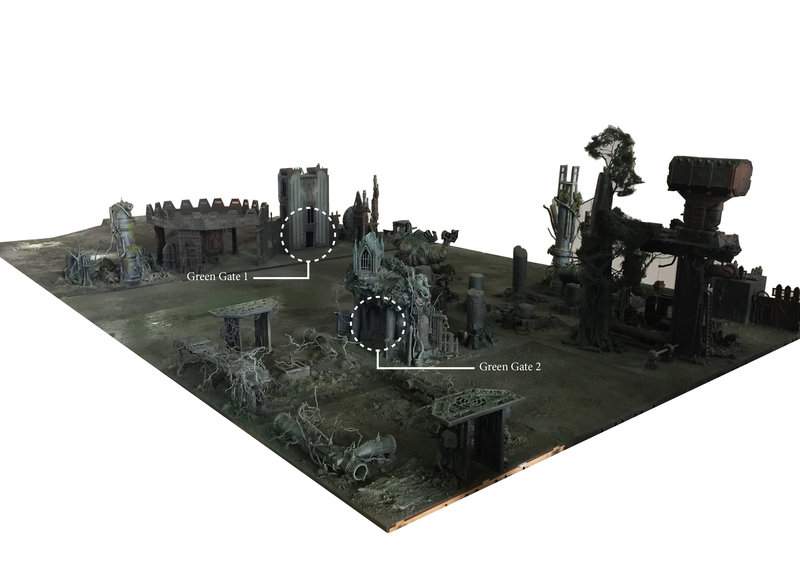 Titan Forge continue to produce what looks like almost the entire chaos dwarf army (bar the hobgoblins) as part of the Metal Beard kickstarter. Yesterday they unveiled the latest addition to the Kashan Vra, the infernal golem, which is far and away the best attempt at a destroyer I've seen to date, including the images I've seen of the Forge World k'daai destroyer. Look at that thing. Look at the size of it. It's bleedin' huge. It's coming in at 800 points on the Metal Beard points system, which translates into about £50ish quid if you take the £61 pledge. Pretty decent value considering the immensity of the model. Titan Forge have also re-jigged the stretch goals, so now almost everything has been unlocked at the £20,000 stretch, including the chosen of Kashan Vra, which sound very much like k'daai fireborn. They are some very intriguing models left to unlock though, such as the ancestral zeppelin, the hell bulldozers (bull centaurs) and the maw of the mountain. 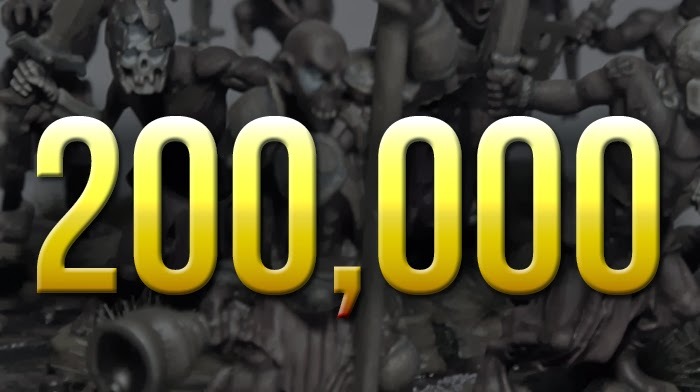 With only 5 days left, I hope they make the last couple of goals as for chaos dwarf players this is a great chance to get some really fantastic alternate models. 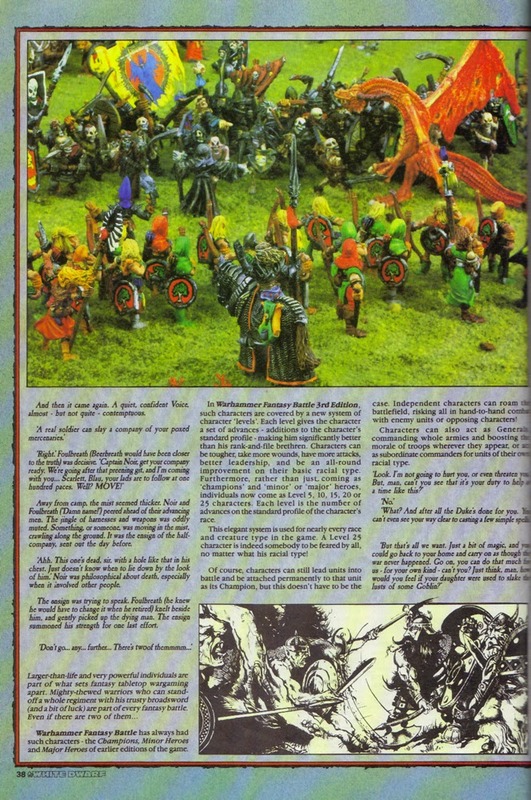 White Dwarf - Favourite Article? Since hearing about the demise of the dwarf, I've been trawling through some of my older issues in search of articles I found particularly entertaining. Much of my reading list hails from WDs from the 80s. There's a lot of back issues, so, in a moment of clarity I decided to throw it out to the community to ask what was your favourite article, or failing that, issue? I don't mean the most informative, or useful or pretty, just your favourite. This will also give us a handy shortlist for further nostalgic wallowing. I'll kick us off. There are a lot of regular articles I could mention. Illuminations, Blanchitsu and Chapter Approved certainly being some notables, and of course, 'Eavy metal. I poured over those pages of painted miniatures for hours wondering how the hell Fraser Gray could paint like he did. There were plenty of great scenarios, the Grapes of Wrath and the Floating Gardens of Bahb Elonn being two favourites. 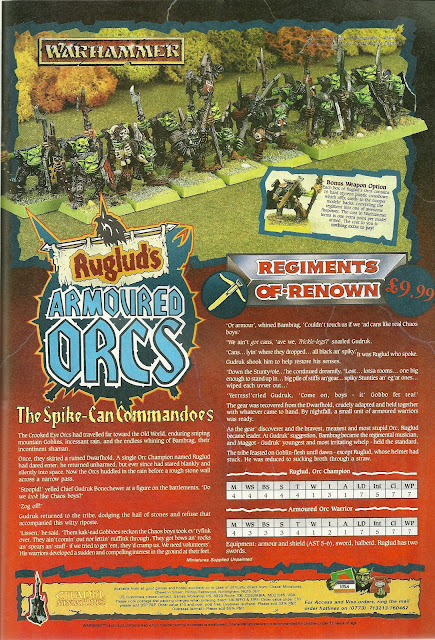 I loved the new models pages (along with all their rules) such as Ruglud's armoured orcs, the plague cart and the gob lobber. This was primarily for the great miniature eye candy, but also for the humour in the back stories. For me though, it has to be the 3rd edition release article from WD 95. It was my first issue, and those eight pages pretty much sealed the deal as regards my future hobby/obsession. Essentially a big advert for third edition, it worked on my young mind beyond the most optimistic dreams of Games Workshop central. There are better articles, for sure, but this is the one I keep coming back to when I think of my favourite. Pages of images of undead, elves, orcs, dwarves and more coupled with stories of heroic deeds and bloody carnage, all wrapped up in a hardback tome. What chance did I have to resist? So what about ye? 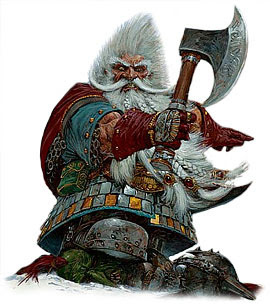 Is there an article, battle report or page of painted miniatures that makes a particular White Dwarf your favourite? After 37 years, White Dwarf appears on the stands for the final time this January. Still technically a rumour, but enough sources have confirmed it that it's pretty much a certainty. This one blindsided me, I can tell you. I've been reading White Dwarf since issue 95, so it's been a monthly staple of my gaming world for 27 years. It's like a pair of comfy slippers or your favourite mug. 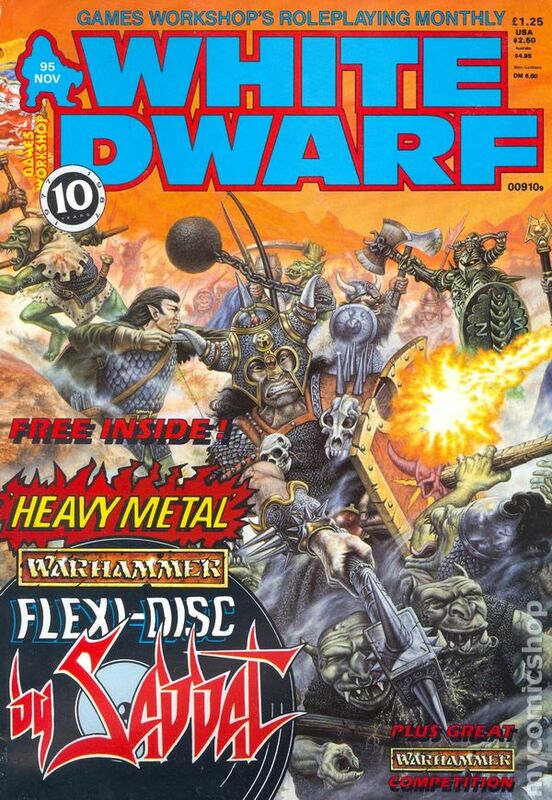 How White Dwarf has slipped in content over the years is old news to anyone reading this. 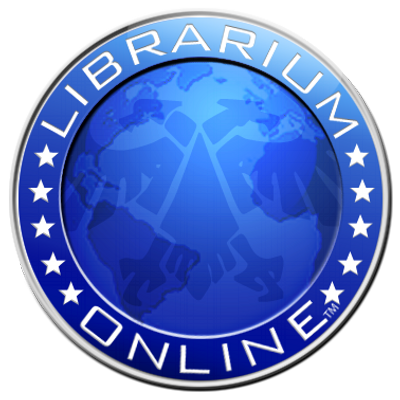 But back in the day it was agog with great articles, scenarios, rules and other gamery info. Even the odd freebie. I still have the outhouse from one magazine that gave away a free card stock building. Observe. 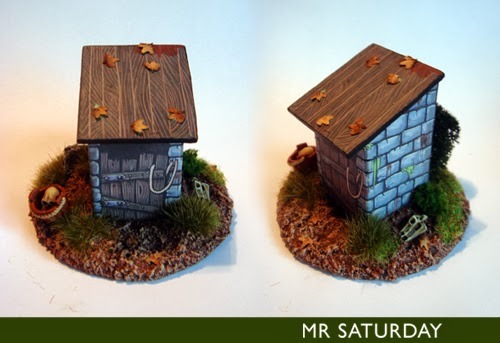 I declare this terrain piece re-named the White Dwarf memorial outhouse. I don't hate White Dwarf now though. 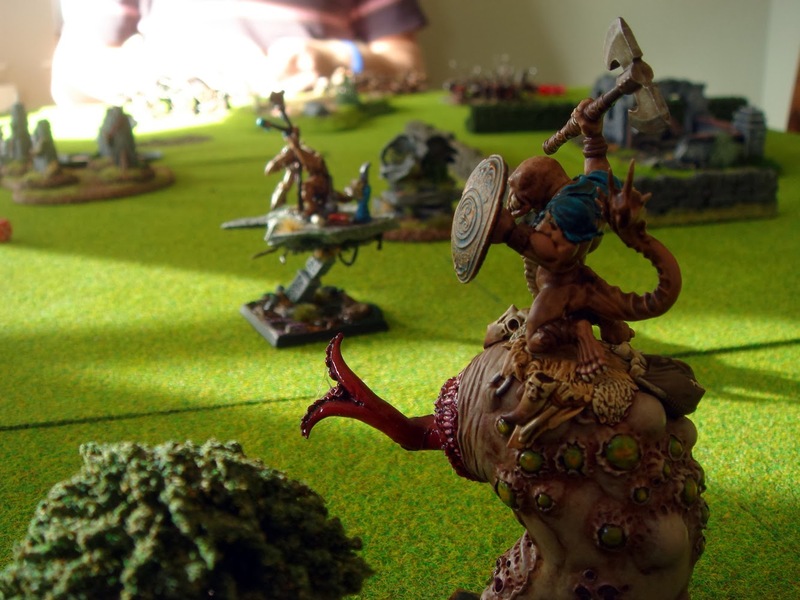 There's still a lot of very pretty pictures, and the odd interesting article or battle report, but admittedly it's not got a lot of meat on it's bones if I'm totally frank. That said, I'm a little choked up at the thought of it vanishing. The Dwarf that started it all. The 3rd edition release issue. To say I was instantly hooked would be something of an understatment. So, what will be filling the void left by the dwarf? Games Workshop are due to make some manner of announcement tomorrow, but according to those in the know we'll get a new monthly magazine called Warhammer Visions which will weigh in at a hefty 190 pages of predominantly hobby content, all for the princely sum on €9, and will be available much as White Dwarf was, in newsagents etc. That does sound good, but well, we'll see. 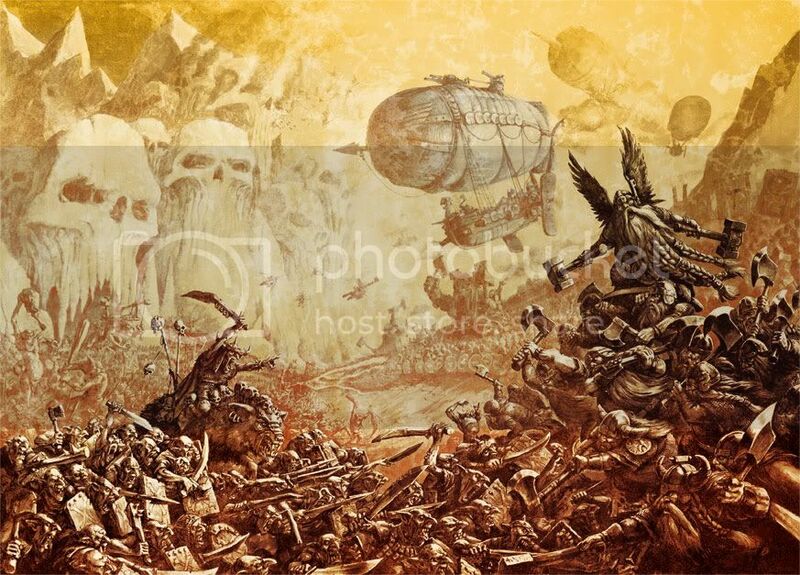 The name Warhammer Visions conjures the image of airbrushed fantasy art rock album covers for me. It's not got the pathos of White Dwarf, that's for damn sure. The second publication will be White Dwarf Weekly (probably), featuring new releases and what else I'm not sure. This will be €3.20. I'm kind of stumped as to what this magazine will be like, and weekly? In any case, it will be available only from independent retailers and GW stores. 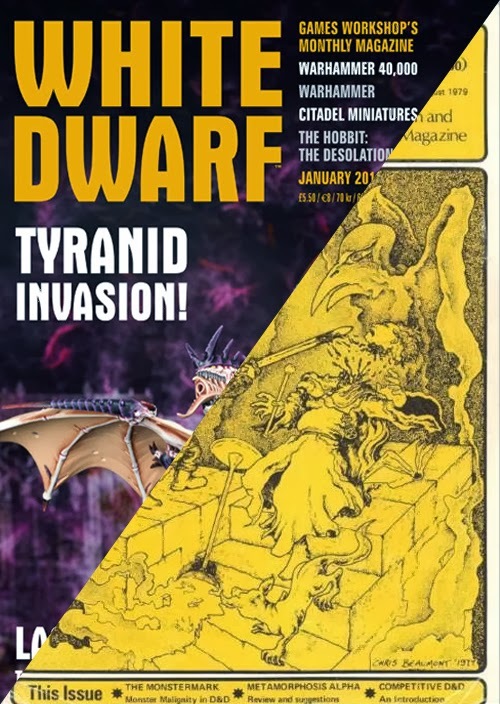 White Dwarf weekly kicks off February 1st. So, farewell oh White-Bearded one, you've given me a lot of joy down through the years. Safe journey to the halls of the ancestors. Now, if you'll excuse me I'm off to wallow in a pile of really old White Dwarf magazines. 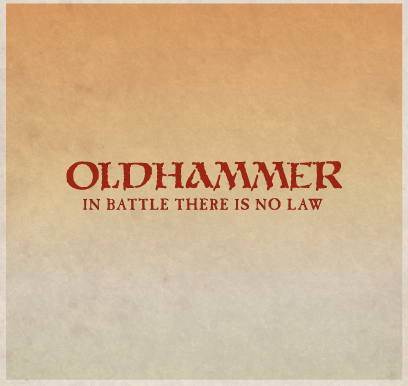 We're just into January, and the rumour mill for the dwarves is cranking into gear. According to the Bell of Lost Souls, the diminutive ones are inbound this February. Lots of new kits including giant tunnelling machines and massive cannons are listed in the releases for the new range. Mmm... tantalising. I wonder if any of it can be purloined for the use of the sons of Hashut? Have no fear, the stunties are on the march - headed your way in February. Here is the rundown of new kits coming down the mountain. No finecast was mentioned at all. If you look at what needs plastic kits in the existing Dwarf range, and look to the old-unit/new unit splits in the Dark Elves release for inspiration, it's not too hard to figure out what's coming. These latest set descriptions dovetail almost exactly with Spanish rumors from early November. After a rather hobby-free Christmas, I have taken up the sculpting tools once more. (I blame Warhammer Quest directly for this lack of progress) My poor neglected dirach finally got green stuffed and is ready for priming. I also cleaned up his diminutive familiar. 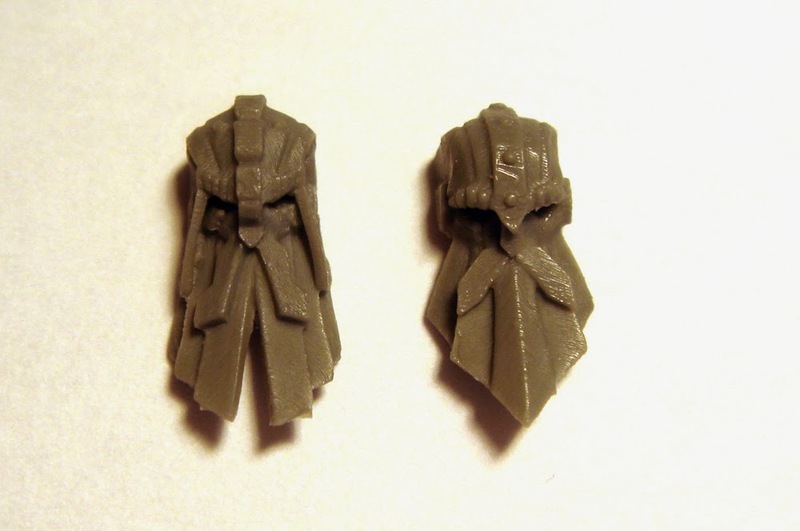 I love old metal Citadel minis, but by hell, sometimes the flash, mould lines and general clean-up can be a nightmare. Thus it was with this guy. I suspect the mould was beginning to deteriorate when he was cast, as there was some miscast under his arm that required some serious elbow grease to remove. Now all that remains are some wizardly paraphernalia to add to the plinth. A book, a scroll, a cup or some bones should do it. I really want to get this guy done so I can get back to painting Crom's hellcannon base and maggoty crew. 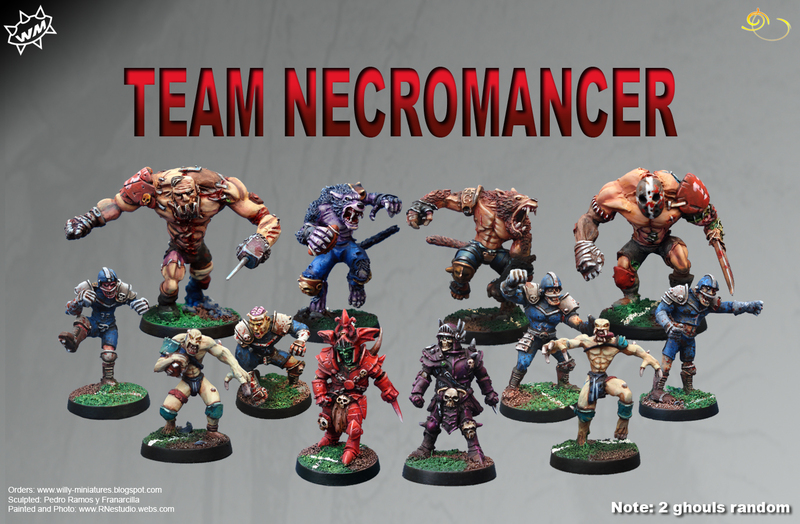 I've also been looking at some Bloodbowl miniatures with an eye to building a new team. 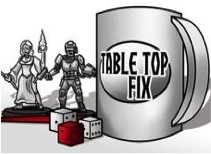 The Necromantic Rain Dogs have been a team of mine online for some time, mayhap it's time to make the jump to miniature form. I've been ogling Willy Miniatures' (wait, that sounds odd, doesn't it?) 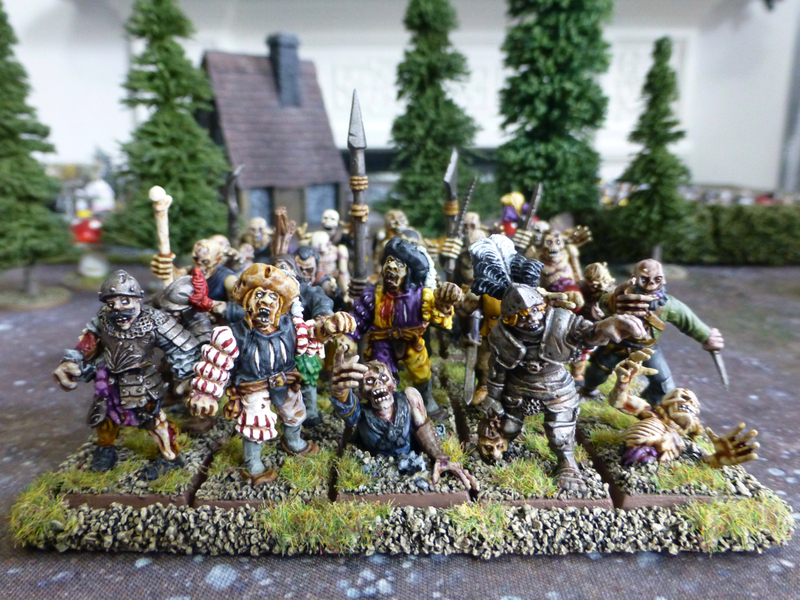 range of undead, in particular the wights and werewolves. The local game shop runs a Bloodbowl league, and it's time I got in on the action. Ah yes, the hobby butterfly has been visiting. Course, a fimir team would be a thing now, wouldn't it?